Thanks to Michael O’Rourke of Dimension 7 for snagging me to do visuals with he and Andre Champagne for the Tribal Funk 20 Year Reunion at Mighty Nov 29, 2013. 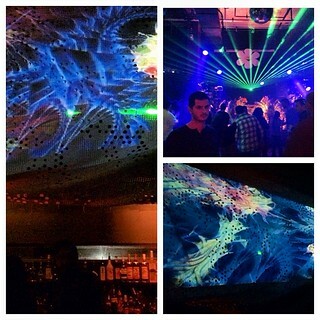 Also soon after (Dec 13 2013) Michael got me to do a quick set of visuals for the last D7 party! 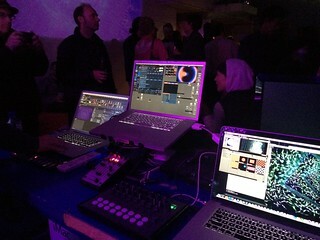 I layered like 5 or 6 different Processing apps together using VDMX. D7 party -the end of an amazing run of video and light art from the 90s and the 2000s and a cool scene which was the homebase and petri dish for some pretty amazing vjs over the years. Not to mention all the cool parties from that era! I used to pop in after a night of coding VRML at Intervista nearby.